The Chief Commissioner of the PNG Accident Investigation Commission, Mr Hubert Namani yesterday released the Preliminary Report into the 28 July 2018 aircraft accident at Port Vila, Vanuatu. “About 20 minutes prior to landing at Port Vila, the right engine of an ATR 72-500 aircraft had to be shut down by the pilots due to a malfunction and the pilot declared an emergency,” Mr. Namani said. Immediately after touching down the aircraft veered to the left and ran off the runway. The pilots were unable to bring the aircraft to a stop or steer it away from parked aircraft on the airport apron. 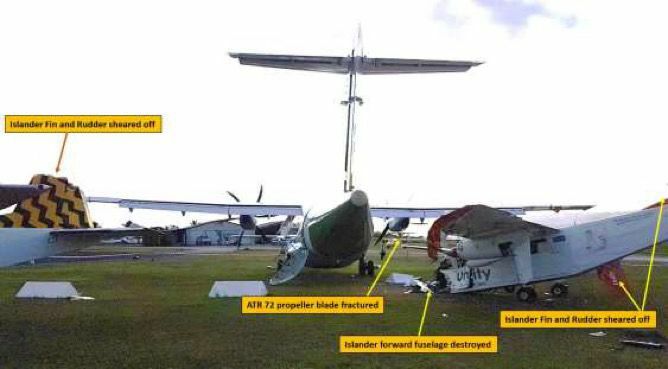 The ATR 72 impacted two unoccupied parked Britten Norman Islander aircraft causing significant damage. None of the occupants of the ATR 72 were injured. Mr. Namani explained that where a country does not have the resources and capacity to conduct international Standard investigations, Memoranda of Understanding (MOU) provide for graded levels of assistance up to and including delegation of the whole of an investigation to PNG. This cooperation and assistance conducted in accordance with the Standards of Annex 13 to the Convention on International Civil Aviation is a very effective way for countries to meet their international accident investigation obligations. MOU negotiations with the Civil Aviation Authorities of the Republic of Fiji, Solomon Islands, and Republic of Vanuatu are at the advanced stages, with signings imminent. Immediately following the accident, the Director of Civil Aviation in Vanuatu (CAAV) requested that the PNG AIC conduct the investigation under full delegation from CAAV. The AIC accepted the delegation of the whole of the investigation. Vanuatu’s Minister Civil Aviation Authority, Jotham Napat, and Alfred Manase, PNG Minister for Civil Aviation fully endorsed the delegation of the investigation to the PNG AIC. Two investigators from the AIC arrived in Port Vila on Sunday afternoon, 29 July to commence the on-site investigation. At the request of the AIC a specialist team from the engine manufacturer, Pratt and Whitney Canada, conducted a borescope examination of the engine and determined that it had sustained significant damage. It is being freighted to the factory in Montreal, Canada where it will be disassembled under the supervision of investigators from the AIC’s counterpart agency the Transportation Safety Board of Canada. Personnel from the Aircraft operator and the CAA Vanuatu are assisting the investigation. 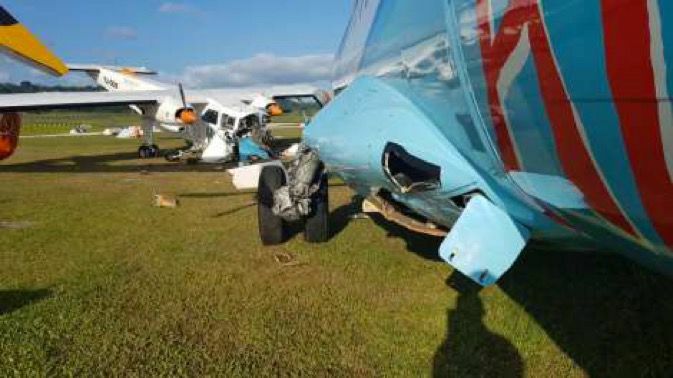 “The AIC has rapidly developed to be recognised as a leading aircraft accident investigation organisation in the South Pacific Region, conducting world standard no-blame independent investigations,” Mr. Namani said. “AIC investigation reports and safety recommendations have received high level endorsement by ICAO, foreign states and aircraft manufacturers.